When I was younger, I was obsessed with Hard Candy cosmetics. I wanted their products so badly, and was envious of those who were lucky enough to have some. It was more expensive than the makeup you bought in the drugstore, so in teenage-girl logic, it was cooler and better. I used to save all the money I could just to buy an eyeshadow here or a blush there - I treasured that makeup so much! Not one to sit on their laurels, Hard Candy re-launched their brand last year! It is filled with a new line of cosmetics & they are STELLAR! Today I am reviewing Hard Candy Just Nails Nail Color in "Mushroom" & Hard Candy Eye Def Glitter Eyeshadow in "Robot". When I received the bottle, I have to admit I was a little skeptical. I thought...BROWN. Interesting color choice. Then I put it on. It's an incredible, creamy looking chocolate brown. It's the exact color of hot chocolate! This could be a great color for spring nails if you're not into the pastel trend. Pair it with a glossy top coat for glamour or use the Hard Candy "Matte-ly In Love" for a more earthy, subdued look. Hard Candy polishes are long lasting & highly pigmented. Hard Candy Eye Def in "Robot"
This product excites the make-up lover in me. The bottle is test tube shaped, so I was curious as to what it could be. Flipped over the tube and there it was --- Glitter Eye Shadow! *squeal* The Eye Def shadows are creme based so they glide on easily. The glitter is extremely fine & very sparkly. The formula of these applies wet and then dries down after a minute or two. These come in a tube with a slanted doe foot applicator for easy application. The shadow transplants a fair amount of glitter on your eyelid, giving your eyes a rich jewel-like tone. These would be perfect to use as a liner as well. 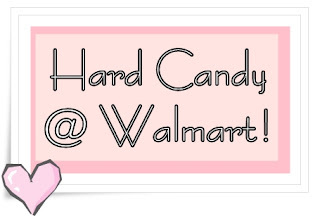 You can see the full line of Hard Candy products online at HardCandy.Com or buy them at your local Wal-Mart or online at WalMart.Com!